Winter is the only time one can travel in India without melting in her heat or drowning in her monsoons. So till we can muster enough courage to take the kid to Ladakh or muster enough cash to stitch together a trip overseas, our travels will be confined to the short Indian winter months and well within her boundaries. One of Aparna's cousin - whose marriage should not be skipped - decided to get married in her home town of Bhopal in December 2011. That meant our winter vacation for this season had to start with a trip to the heart of India. A short consultation with The Book (a.k.a Lonely Planet) reassured me that Bhopal is not all that a bad place to take a week long vacation. There are no direct flights to Bhopal from Pune; but no two cities in India are left unconnected by a direct train link. So train is how we made it to Bhopal, reaching the city one early Saturday morning. Upon freshening up at the hotel, we took turns to check out the much talked about (at least in the travel circles) Museum of Anthropology (a.k.a. Manav Sangrahalay). Aparna, my mother and yours truly contributed to the "we" in the previous sentence - my mother being the important person to ensure that the turn-taking events don't end up being sad and lonely affairs. The Anthropology Museum, housing authentically re-created tribal dwellings from all over the nation, held up very well to our high expectations of it. I wasn't aware that I shared my country with so many fascinating, yet alien cultures. The following morning we took a pilgrimage to the three main mosques in the heart of the city. Bhopal holds an unique position in Indian history (probably in the world history, given that the lofty tales of the Grecian Amazonian women are now found to be entirely made-up) by the fact that it was ruled by four successive generations of women rulers. The three main mosques were built by the first three Queens/Begums, each trying to out-do her mother. 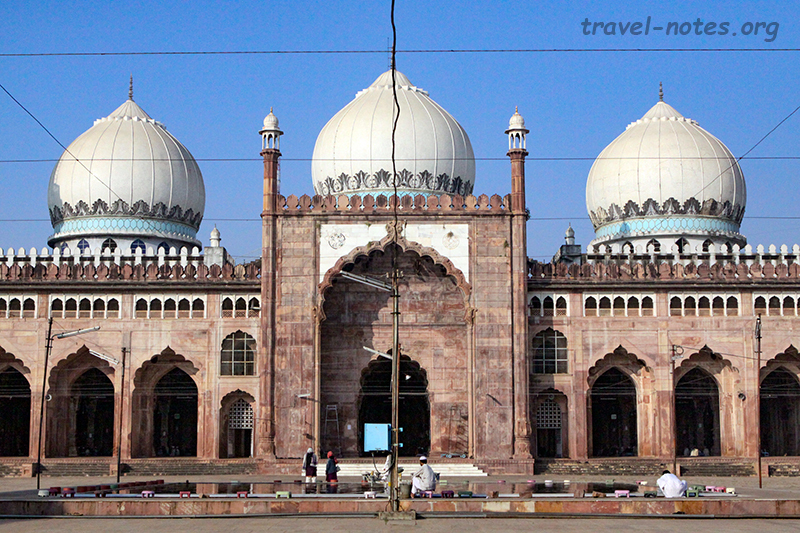 The crowning glory is the Taj-ul-Masjid by Shah Jahan Begum, claimed by the locals to be the largest in Asia. It was indeed started off with the intention of making it the largest, but at the end it ended up being just the third largest in the nation after Delhi's Jama Masjid and Hyderabad's Mecca Masjid (source). However, that fact did not come in the way of us being awe-struck by its size. Most of the next two days were spent on the primary purpose of the trip - the marriage. Somewhere in between, we managed to squeeze in a trip to the local high point, a pretty Jain temple sitting atop a hill which gave us a pretty good view of the city and a more than impressive sunset. Bhopal started its life as Bhojpal, a town founded about a millennium ago by Raja Bhoj, one of the most celebrated kings of India. Celebrated because he heroically delayed the Islamic invasion of India by a couple of decades. He built a large reservoir (known today as Bada Talab/Bhojtal) which still quenches the thirst of the city. 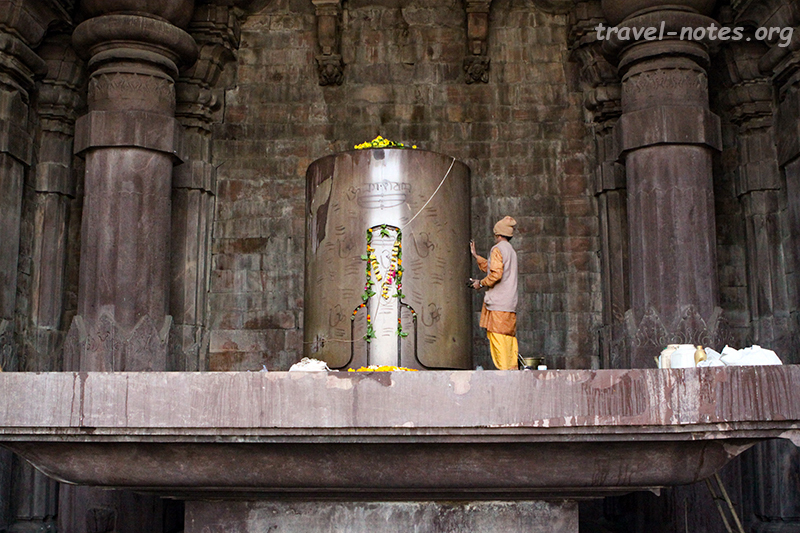 He also built a gigantic unfinished temple at Bhojpur, a town located about 20 kms south of the city centre. The 22 ft tall temple lingam (the phallic symbol by which Shiva is worshiped by Hindus) is claimed by many locals and some guidebooks to be largest in the nation. But Wikipedia disagrees. But who cares - the temple and the lingam is still stunning and worth a visit. 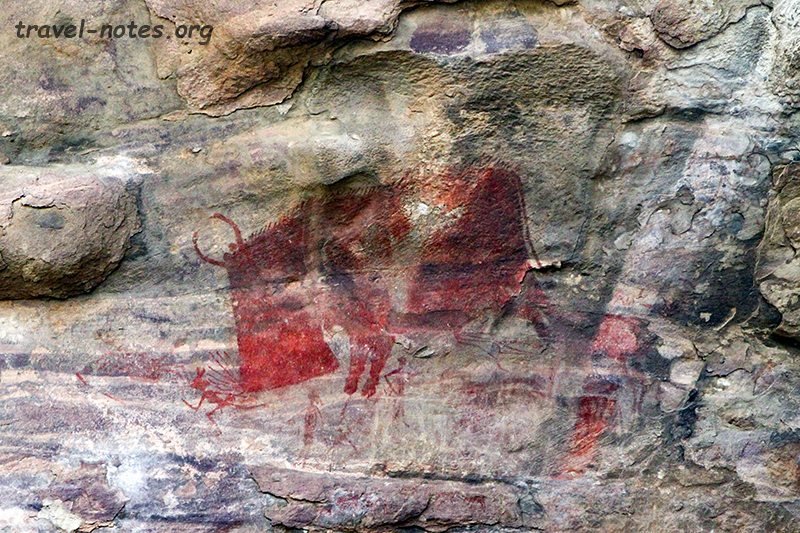 The human inhabitation of the region pre-dates Bhoj by many more millennia, signs of which are wonderfully preserved in the ancient rock art site of Bhimbetka. The site is an encyclopedia of the cultural evolution of the region. The earliest rock art starts from about 10,000 BC (old enough to pre-date colour and gods) and as centuries passed, colour, horses, gods, kings, folk dance parties and graffiti were added to the palette roughly in that order. The dynasty that led to the rule of the Four Begums was started by Dost Mohammed Khan in early 18th century when he founded the modern city of Bhopal by establishing his capital in Islamnagar, a nondescript hard to find suburb of Bhopal. We did eventually find this place after a painfully long search on a slow auto rickshaw ride on the following morning. The place houses a couple of reasonably well preserved buildings from that era and if you can get to the site, you can pretty much have it for yourself as no one else will likely get to it when you are there. Before we left Bhopal for the highlight of our trip, we did check out its new state of the art State Museum. The museum itself is quite refreshingly modern and with gems like Khajuraho, Mandu and Orccha scattered around the state, it was no surprise to find some stunning sculptures housed in here. However the piece de resistance was indeed the one that Lonely Planet recommends - the Metal Carpet Seller from the Nawab's Royal collections. We still cannot believe that the carpet the metal seller is selling is also metal and not fabric! The highlight of the trip alluded to in the above paragraph was Sanchi. In 262 BC, emperor Ashoka after his battlefield conversion to Buddhism, built a Grand Stupa here as a proof of that event. He chose Sanchi as his chief queen was from around here. The wooden Stupa is now completely hidden inside a stone one built over it around 200 BC by Pushyamitra Sunga and Satavahanas later added a surrounding wall and four interactively carved sandstone Toranas/gateways. Toranas hold an explosion of relief depicting scenes from Buddha's life - it is a pity that my knowledge of Jatakas lies somewhere below my understanding of quantum mechanics. After coming this far, we didn't want to miss out on the Udaigiri Caves - a 20 odd caves dating from the Gupta era located about 10 kms from Sanchi. 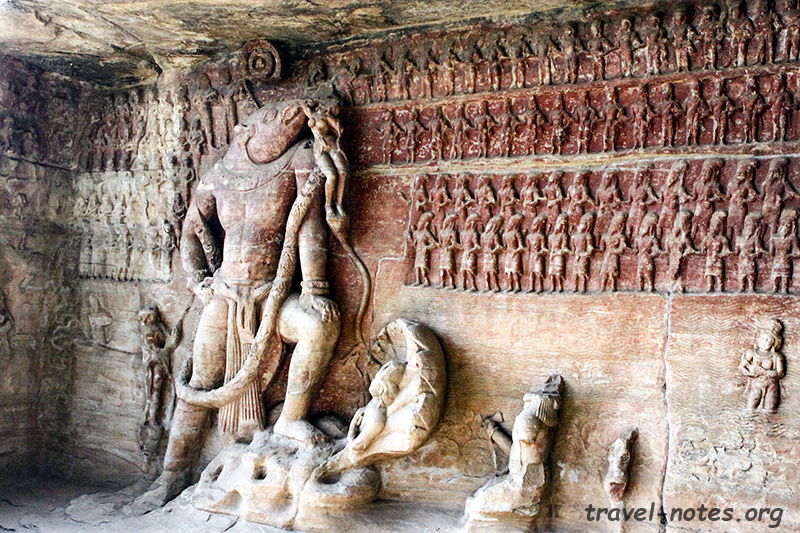 The eye-catching image of Varaha and the Shiva lingam with the face of Shiva carved on it were well worth the effort. Any historian worth his salt never leaves this place without visiting the Heliodorus Pillar - a pillar that proves that ancient India and ancient Greece had much closer relationship than their modern avatars. Since I consider myself a very salty historian, we all paid our homage to this pillar before bringing our week long trip to close. Click here for more photos from Bhopal. 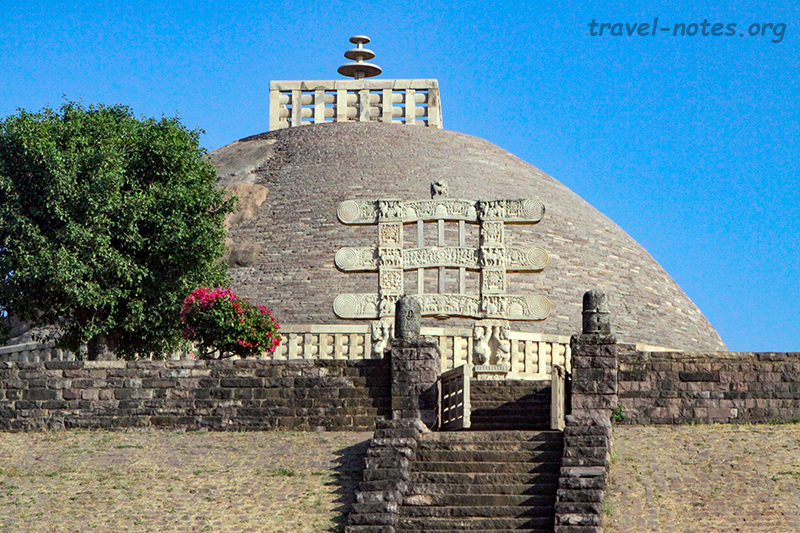 Click here for more photos from Sanchi.